"Don’t ask yourself what the world needs; ask yourself what makes you come alive. And then go and do that. Because what the world needs is people who have come alive.” "
Capturing the priceless moments, subtle details and grand emotions of life's most romantic events, L'Amour Photography is a Hawaii-based journalistic wedding photography company dedicated to the highest artistic and professional standards. What began as a labor of love by husband and wife team Wendy and Eric Leslie-Mansperger has blossomed into a team of industry leading photographers and videographers with world-wide demand. Each team member brings diverse talent, yet we are united by a vibrant aesthetic, strong technical skills and a dedicated work ethic. 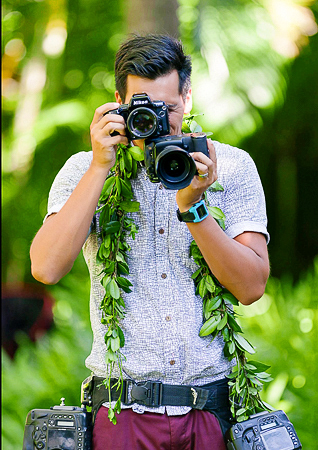 L'Amour Photography and Video has been Published internationally in magazines such as Pacific Weddings Magazine, Elle, Anhelo, Hawaii Bride and Groom, and Destination I do magazine as well as featured on VH1 and Entertainment Tonight. Please enjoy browsing our galleries and especially our blog - they are great ways to get to know us better.